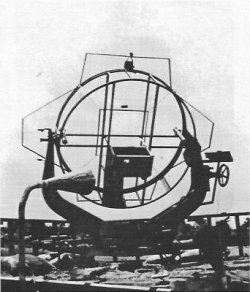 The Tachi-4 was a land-based gunlaying radar intended to replace the Tachi-1 and Tachi-2. It was known in prototype as the Mark Ta Model 4 (Chijo-yo Dempa Hyotei-ki, 4-gata) and was based in part on a captured British gunlaying radar from Singapore. The original dipole elements were replaced with Yagi arrays, the center array acting as the transmitter and the four other arrays being partially electronically steered.